This is part 14 of the Freelap Friday Five Series, Season Three. To review the past 43 interviews, click here. I “met” Carl Valle on the Internet over a decade ago, along with Pierre-Jean Vazel and Mike Hurst on the now defunct Charlie Francis Forum. 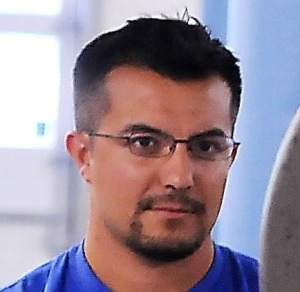 Carl Valle is a USATF level 2 Sprints and Hurdles coach and guest writer for various websites. Since 1997 he has helped athletes improve speed and power in various sports and his areas of interest are technology and regeneration. He has coached high school, college, junior college, and post collegiate athletes and the results of their hard work resulted in accolades ranging from school records to All-American status. Carl provides support services to post collegiate athletes and his website is Spikesonly.com. 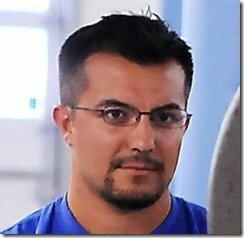 He is a regular contributor to FreelapUSA, different blogs including SpeedEndurance.com, and online magazines. Finally, he enjoys Flamenco music and Spanish food in his spare time. Question 1: You have worked with athletes of different sports and spend most of your time on speed development. As a coach, what is your general methodology of speed training when so many experts exist out there with different ideas? Any sound principles we can learn from? Carl Valle: Clearly I have no commandments and don’t have the pulpit to really tell others what to do, but I have witness or have tried a lot of what people share and have enough scar tissue to know that training is humbling. Most of the results are coming from the athletes showing up over time, and honestly I have failed more than I have succeeded and not afraid to admit it. Look at the results of teams and see improvement curves and compare parametric analysis and you will see Olympic sport is hard. Speed development is a perfect example of the worst investment you can make. You basically put in a pound to get an ounce, because working for 46-50 weeks a year to improve a percentage (sometimes regress) is not glamorous but what most sprint coaches need to do. Look at history and see that development takes time. Simplicity is touted but rarely enforced. A simple program done well is very complicated and hard, so don’t shoot yourself in the foot by exotic work and doing stuff because people are thinking they have solved the riddle of the sphinx. Soon as things get complicated adding more brainpower usually means more headaches. It’s ok to sprint to get faster at sprinting, don’t complicate things because it is brain candy for bored coaches. I can get into more but honestly I feel that talking to Tom Tellez in person was the best wake-up call for me because he was so brutally blunt and straightforward. Countless other coaches have helped me as I make mistakes every day, but hearing the vanilla suggestions by Tom was extremely helpful and made me want to keep things elegant and not exotic. Question 2: Massage is popular with athletes and you have seen some of the best people in the world do therapy and you are very outspoken against instruments and therapy courses that are overhyped. Could you share why you are not on any bandwagon? Carl Valle: Steve Jobs pointed out the hand and specifically the fingers are amazing tools yet because you can’t sell them people are focused on instruments. Another popular trend is palpation skills and I am happy that the direction is going there but some of the courses I see people attend are no t showing up with athlete/patient outcomes as much as people say on social media. I have the elastography data done daily and medical imaging to prove that sometimes healing can happen with scraping part of an Achilles tendon but I need to see more to be on the bandwagon. The issue I have is that many times traditional strokes and time will resolve problems if return to play strategies are fully exploited. The problem is some therapists don’t have time, don’t want to put in hard work, and don’t want to really improve their expertise, or gain real experience. The formula for therapy is find a pet method or device and create a system to sell to younger therapists by attaching results to elite athletes or impressive pseudo science. Like training, manual therapy should follow biological principles and manage tone and function. Watching Waldemar Matuszewski (see #7 Recovery Will Determine Training Objectives) loosen tissue is like transforming gristle into braised ribs, so some talent is clearly involved. Reading research on massage will not make you an expert, so put the time in and rub as they say. I have never been a fan of the 10,000 hour rule but repetition and experience takes time and some will be better faster than others. I have seen enough muscle diagnostics reports to realize that a good hands-on therapist that is blue collar is far more valuable than the guy presenting at mega conference. Athletes vote with their feet and we need more in the trenches work than on the pulpit or podcast experts. READ WMA 2010 Indoor Championships – Did they Play by the Rules? Question 3: Vertical and Horizontal forces are a big topic and you constantly talk about why you think we should focus on foot strike and posture over muscle groups and specific weight training. Are you still against the barbell hip thrust or do you find it a valuable tool? Carl Valle: I subscribe to Bret’s monthly subscription (click here for more info) and find a lot of his summaries to be helpful in being informed with research, so I am not against anything he is suggesting. My personal mantra is show me the results and the influence of the variables on those outcomes with any training modality. His surface EMG readings were extremely pioneering and most of his data seems to be accurate, as I have done similar experiments. Teams should be doing similar experiments on their training and leverage their own data. I have done work with surface and fine wire EMG and find some exercises and sprinting to be invaluable for program design, but sprinting still helps sprinting. Elite sprinting is not 100% natural so some tinkering needs to done to get the body to achieve top times, but let’s not overthink things. Vertical and horizontal forces are part of the natural stride and the expression and distribution of those forces are seen as the velocity of the athlete becomes faster. Several studies exist that are conflicting and that is fine, but I have seen elite athletes get tested and the results are crystal clear, any specific lifting done will not do much with a good holistic running program. The Barbell Hip thrust is an option to a set of muscle recruited in sprinting, I have yet to see the influences of any particular exercise in top speed splits by proponents. Posture, meaning how the body is leaning and aligning itself during acceleration and at top speed is part of the equation with applying forces effectively. Sprinting is a skill and no exercise can work wonders in such a demanding event group. I do not support any exclusion of any safe exercise, and since barbells seem to be an endangered species now with some circles, I reserve the right to say placement should be prescribed on needs and circumstances. Some athlete may need it and should do it religiously, and others may want to choose something else. No matter how much you know you still have to do it, and what looks good on paper could be a formula of failure. I have tried some of the exercises and I think it may be good for early fall GPP in colder climates but if I look at the meet results some are doing rather well without using it at all. Finally, I don’t get why people just do air hip thrusts or light activation patterns when loading heavy is following the basic principles of strength training. Steve Fleck said in the late 1990s don’t fall in love an exercise, and I have no emotional attachment to anything even the exercises I like to do for myself. Question 4: Monitoring is a popular topic and you have done a lot of evaluation of equipment and software to help coaches observe fatigue. What are the best options and how can we do a better job getting data without treating athletes like lab rats. Carl Valle: I frankly hate monitoring to see if athletes are tired, as management of training is a better evaluation of being ready. When your training isn’t giving you a very sound indication of fatigue, rethink your program first before adding “monitoring”. 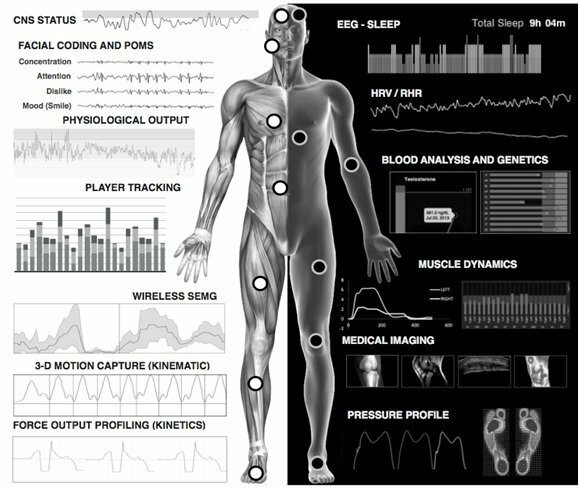 As you can see from the graphic I tried everything and my collage shows a lot of things can be measured, but you got to know how to develop the athlete first. Sure physiological monitoring is valuable but they are estimates and crude summaries of what is going on and should compliment, not replace, training data. One example of poor uses of monitoring is looking at speed bands from player tracking during games and practices. If you don’t time linear sprints or different agility with maximal output, how are you evaluating your data to when athletes may not be going all out or have so many situational and contextual factors that make interpretation guesswork? Also like I mentioned a few times, player tracking is not sensitive enough to really detect medical data we need. Current player tracking is volume and distribution, with some estimation of crude forces with sensors. Teams must combine player movement evaluation with more technology if they want to see injury patterns from the mechanical factors. I would bet the farm that combining both is the future, and this is going to be a long process for those that are not familiar with real biomechanics. Here are my commandments and suggestions for teams handling an array of challenges with player monitoring needs. Ten are listed because it’s a nice number, but you can spend hours talking about the points made. 1.Find the area you are most weak at and fix it. Stop masking problems by highlighting personal biases and using technology to make things appear magical. Nobody loves technology than me and I have player tracking hardware and garments that are 5 years ahead of professional teams, but the advantage comes from looking at what makes the biggest impact, not the most fascinating. If your athletes eat like crap and sleep poorly like we all know, focus on behavior changes and make progress. Everyone has the same problems so don’t try to keep up with other teams likely dealing with the same issues. 2.Algorithms are real tools if build right, but most of them are just glorified software patches to help do damage control to data that may not be accurate. Anyone using the term algorithm should be asked to name the precise people who created them and how are they validated. Medical algorithms are hot right now since basic rehabilitation is still a challenge. When in doubt just ask for raw data and hire the right people. 3.Hardware will fail. Batteries will die. Computers will crash. Cloud will go up with smoke. Don’t worry as coaching, as Bob Alejo once said, is cutting edge. Always have an old school input and output solution waiting and ready to go since barbells and grass fields will be waiting and ready. I can go analog (pen and paper) and get more data and better workflow than any commercially available solution. The Electronic Health Records are still lame and all Athlete Management Systems that are available are garbage. Build your own and have multiple forms of backups. 4. Extensive blood testing done 4-6 times a year should be timed on specific milestones in training and combined with testing to create the best value. Each year the costs, speed of testing, and the expansion of biomarkers improve. I don’t care what service or lab one uses just make sure nutritionists, medical teams, and performance coaches get their own biomarkers included in the tests and create interventions. 5. Use the word surveillance with internal teams and the phrase guardian angel with players to fight the big brother fear. Collecting data is the first challenge so change the culture by showing they are on your side. Maybe this should be number 1 or the only suggestion, but it’s just a list of the top of my head. 6. Reinforce data collection by having a response so the athlete feels the data is being used each time they provide information. Some data doesn’t need a full response or intervention, but just a quick thanks or acknowledgement is a good start. The more the athlete sees their data being involved in a good way the more they will help, but not using data is also powerful as well. Knowing that you can interpret and decide what to do, including not letting a machine drive everything, empowers the coaches and medical staff that experience and expertise rules. 7. 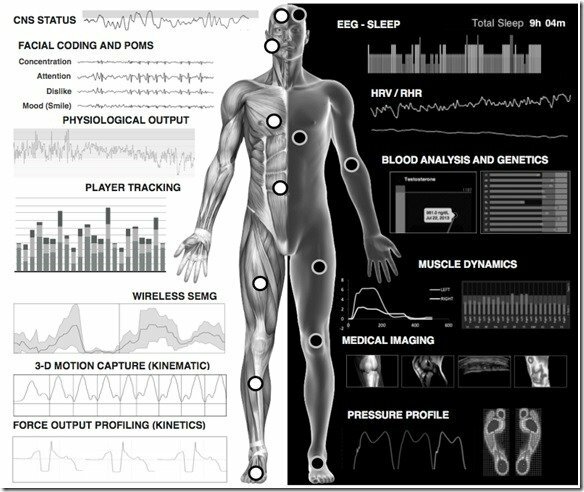 Physiology is nice, but performance and medical data is better. Don’t get me wrong I love all the sensors and feel that it’s important, but the bigger problems is medical data is sparse and not objective, and performance data is shrinking from less training and overly conservative training Derek Hanson referenced. 8. Tissue and joints are what usually dooms teams, so stop extrapolating and skip the middle man by getting better staff that can handle diagnostics. I am agnostic to the tools but make sure one can get data on the tone of tissue and the readiness of it. Most teams claim they care about hamstrings and adductors but when I ask for a report on a player I get a long silence and an explanation. I don’t care what you use but use something, be it Thermography, Tensiomyography, Elastography, or myoton readings. 9. CNS fatigue is talked about but if anyone wants to show how they evaluate it with EEG feel free to contact me. EEG is used because it’s consumer friendly and inexpensive, and while I wrote about usage, the current products are not accurate. Brainwaves are only part of the picture and are influenced by other areas that require additional testing, so if you are putting decisions into EEG, do your homework again because the research isn’t there. 10.Subjective indicators are great and to enhance them use facial coding software with players. Players have smartphones with cameras so use them for something productive instead of instagram poses at 3am with the wrong crowd. Just small clips add up over time and video log communication with players is valuable and overrated. Question 5: Regeneration is popular topic and many have theories that too much artificial recovery modalities can actually decrease adaptations creating detraining effects. Some argue that anything outside of rest or nutrition is hurting the body’s natural recovery processes. Could you explain why this idea is not so black and white and how elite sport may break the rules of biology? Carl Valle: Natural or normal is not elite sport, so let’s talk about reality. Good health ends when good sport begins, and we have to recognize sport is not always humane. Remember most sporting activities are about entertainment schedules, not optimized calendars for the body. When we talk about internal and external means of recovery, it’s important to talk about what cellular responses are happening and then see what is the best way to modulate that stuff without creating a need to recover from the recovery items. Time, sleep, nutrition, and lifestyle factors are first, followed by assistance with some therapies will help. Unfortunately a lot of people are overreacting to small studies and pontificating a lot of information that is incomplete. Let’s talk about two areas that are popular right now, cryotherapy with injury and antioxidants for nutritional support. The main argument is that inflammation will provide healing, and the chemistry will signal to the body the messages for adaptation. Artificial support will interfere with the signals and this is true for many of the studies tweeted by gurus, but again, read and interpret the research carefully and leave the abstracts for pretenders. Some studies show Icing for injury may not be a good idea and some gurus hyped the Marc Pro like it was turning athletes into a legion of “Wolverines”. It was a borderline bro science in my opinion to share EMS as a primary mechanism for improving lymphatic changes. Even if you hook up 6 pads you are only making a trickle of change when in reality some athletes need a power flush. It works and the research supports a significant change statistically, but we need a nuclear option, as it will take 6 hours or longer to get the changes of a pool workout or compression device. I am not experienced enough the unit but angiogenesis and pain management are suggested outcomes, and I am investigating those benefits now. The lymphatic system influencing free protein kinetics and the immune system is a little vague and poorly summarized but the point was clear enough. The H-Wave study on swimming and lactate clearance (don’t get me started) indicated a warm-down was more effective than using the device, and the same thing can be said for lymphatic work and light exercise. You will get more out of a Zumba class than hours of EMS use if you are trying to help with recovery. Injury is a different story. I agree that the lymphatic system is essential to recovery, but the EMS use may help do other things to help manage symptoms, so a clear cause and effect is not available in uncontrolled setting. Back to Ice. Some studies by leading researchers show that acute injury may benefit from ice and some autonomic responses with HRV show that cold-water immersion works with athletes. Feeling better and muscle repair are not the same, and some very specific protocols are needed or you could be reducing adaptation signaling. Should you ice chronically? I wouldn’t. Is ice effective with secondary injury from an inflammation wildfire with severe injury (grade 2-3 muscle tear) TNF-alpha induced microcirculatory dysfunction? The 1-2 day delay from cryotherapy is not a big deal when other support techniques are added, and those with the right medical algorithm can save a week or more with progressive rehabilitation systems involved with longer injury timelines. Remodeling tissue from strength training should not be interfered with unless you have a very good reason. To make things easy, what we are trying to do is manage inflammation from acute injury, not stop it for training. Research with humans isn’t easy as ethics play a role of what can be studied, but I have seen enough readings to think that ice still has a very important role but limited one. Remember when you tear up a knee; ask how “Mother Nature” plans to fix your ACL and MCL with Paleo diets and animal flow routines. Medical interventions sometimes are appropriate. To quote Bill Knowles loosely, it’s better to have better training in the same time frame rather than returning faster after injury. The more aggressive one can rehabilitate without compromising structures of the body the better. Another wise coach said recovery is about being more completely restored rather than how quick you can train again. Time matters. Now antioxidants and other dietary and supplementation factors such as nutrient timing and high dose methods. I still have athletes drink carbohydrate and protein drinks right after workouts and realize the window may not be as important as we think, but if one still needs to consume more calories and protein than normal, meals are harder delivery options. The mitochondrial biogenesis ideas we see in soccer and endurance are overhyped. They may be appropriate for distance athletes and heavy training may create low glycogen stores that result in favorable changes, but mixed sports should not mess around with this unless you really know what you are doing. I have had athletes destroy Yo-Yo tests without going Paleo and doing double sessions. I did one report for a professional soccer player and his agent and his testosterone profile for the year looked like one for an old man, even during rest phases. If I had to suggest nutritional interventions I would favor Alan Aragon’s work over the caveman nonsense that was adopted this year by one professional team that was decimated by injuries. It’s not that their diet necessarily caused the injuries but they didn’t convince me they were helped perform better by drinking marrow and eating salami. It’s not about low or high carb diets or even type of sugars as much as cellular and biochemical optimization in professional sports, a very unnatural world now. So what is the take home? I think nutrition should be about complementing specific issues and doing the basics. We know that the research shows mixed results with additional support such as antioxidants but some studies show that while the signals for adaptation may have been compromised, the test results are the same. Some show VO2 Max decreases, some show cortisol reduction after competition dropping, but make sure one is not deficient and not malnourished before playing games. I have made several mistakes but what I learned is measure what you want to improve in your body and see the direct cause and effect. Blood testing routinely works but requires really good interpretation and I would focus on how training and nutrition is changing things rather than trying to get ergogenic boosts by mega dosing. After “everything in moderation” and spending most of your efforts on the basics, make changes by careful adjustments and testing. Support the body naturally and not step in front of it if you can.